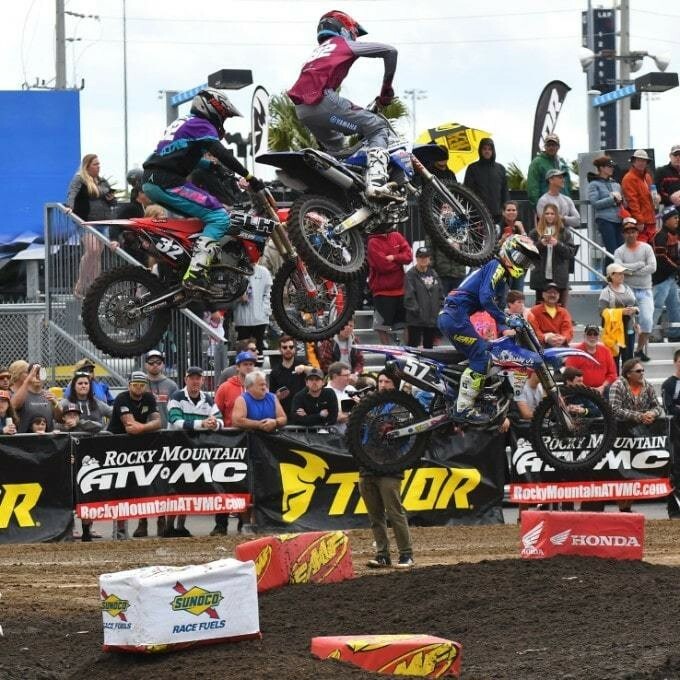 Rocky Mountain ATV/MC will continue as a sponsor in 2019 for the Tenth Annual Ricky Carmichael Daytona Amateur Supercross Championship (RCSX) held at the Daytona International Speedway. The event takes place March 10-12, 2019. RCSX is a premier, one-of-a-kind amateur event that provides up-and-coming riders with the unique opportunity to compete in supercross-style racing on one of the most prestigious proving grounds in the country. With no prior qualifications required, amateur riders can compete in over 35 classes ranging from 51cc up through the Senior and Vet classes. The race format includes heat races and last chance qualifiers to narrow down the lineup of riders that will participate in the main event for each class. RCSX is once again serving as the opening round of the American Motocross Majors, the first of five leading amateur MX events across the United States. The three-day event will kick off March 10. The Daytona Supercross will take place the previous day, giving the riders the opportunity to arrive early to watch the professional races. Riders and their families are invited to camp on the Daytona infield for the duration of the event. This year will feature a whole new event: the Daytona Vintage Supercross (DVSX), where racers can compete in multiple classes using vintage bikes. "We've enjoyed being a part of the Ricky Carmichael Daytona Amateur Supercross Championship for the past five years, and are excited to sponsor the event again for 2019," said Dan Thomas, CEO and Founder of Rocky Mountain ATV/MC. "RCSX is a great opportunity for the amateur community to get out there and compete, and we are happy to offer our continued support." The sponsorship includes providing $20.00 in Race Gas credits to each participant who competes in at least one class. These credits can be used to purchase any product on www.rockymountainatvmc.com . "I want to thank Rocky Mountain ATV/MC for sponsoring RCSX again this year. Winners are the riders that work hard, and RCSX is a good way to set an example for these young riders to get on track for a successful racing career," said Ricky Carmichael, the 15-time champion endorsing the event. "I’m always happy to see these new riders and their families make a weekend of it." The Ricky Carmichael Daytona Amateur Supercross Championship, produced by MX Sports, offers an opportunity for amateurs to compete on some of the most prestigious motorsports grounds in the world— Daytona International Speedway. Run in conjunction with the Daytona Pro Supercross during the first weekend in March, the two-day amateur event follows a supercross format, using heat races and last chance qualifiers to seed the field of riders into a main event in each class. Classes are available for youth riders on 50cc bikes all the way up to Vet and Senior classes. Riders do not need to qualify at other races in order to participate in the RCSX at Daytona. For more information, please visit www.RaceDaytona.com .